This is a Filipino style beef steak. Made from thinly sliced beef and marinated with soy sauce, calamansi juice, pepper and liquid seasoning. It should be marinated for at least an hour for the beef to absorb the marinade. In choosing the beef, tenderloin is the best but it is expensive compared to other pasts of the beef. 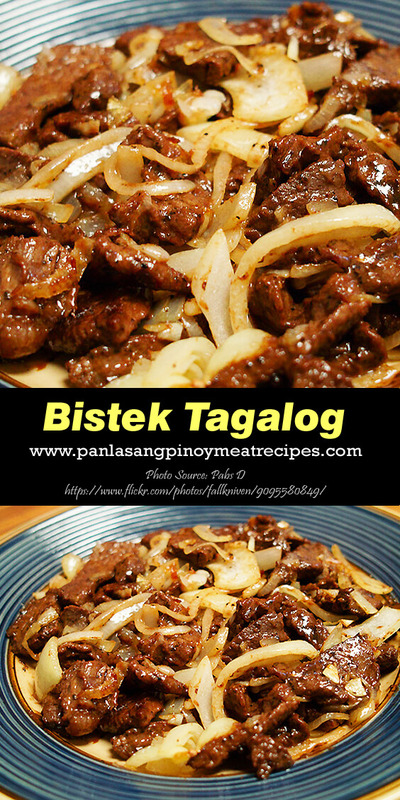 You can use beef briskets or shoulder for making this bistek tagalog. Cooking this bistek is simple and requires few and simple ingredients. First of all, you should marinate the meat with calamansi juice, soy sauce and liquid seasoning. After marinating, stir fry the onion first until tender then set aside. Fry the meat until brown then boil it with soup stock together with the marinade until tender. Add more water if necessary to avoid drying up and burning the meat. Then garnish with onion rings. You can also cook the onion rings by stir frying for a few minutes. Serve it with steamed rice or fried rice. This is a Filipino style beef steak. Made from thinly sliced beef and marinated with soy sauce, calamansi juice, pepper and liquid seasoning. Marinate beef in calamansi juice, soy sauce, Knorr liquid seasoning, pepper, and MSG for at least an hour. To make soup stock, boil beef or pork bones and add onion and garlic. Simmer for 2 to 3 hours then use the broth as soup stock. In a pan, heat some oil and stir fry onions until half cooked. Set aside. Fry beef in oil until brown. Add soup stock and marinade then boil until meat becomes tender. Add more water if necessary until the beef is tender and there is some liquid left. Season to taste. Garnish with onion rings. Serve hot. Wow yummy! 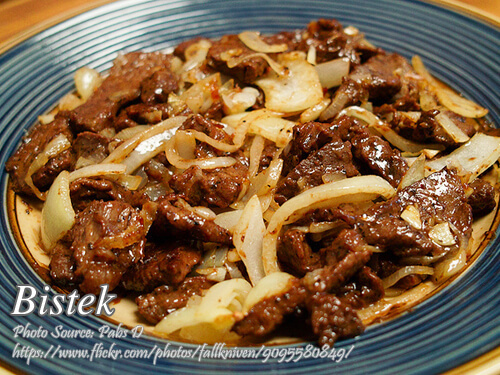 I want to try cooking this bistek recipe! Hi Joshua, thanks for your comment. I’m sure you can cook this with ease. How do you make a soup stock???????? I’ve always subscribed to panlasang pinoy it’s the first time I’ve encountered an ingredient that’s vague and very unhelpful. It’s annoying. Soup stock. Where do I get soup stock. It can’t be beef or chicken broth can it? Coz if it were then why put soup stock and not beef or chicken broth? Soup stock. By the way, I made a little update on the recipe regarding how to make the soup stock. Hi Kuya Manny, what is the best type or brand of soy sauce for bistek? Salamat po! Hi Armids, if you can find Maggi Soy, I think it will taste great.